With the business end of the Pro Kabaddi League Season 6 upon us, the action moves over to the port city of Vishakapatnam as the Telugu Titans play their home leg at the Rajiv Gandhi Indoor Stadium. The second match of the night will see the defending champions Patna Pirates battle it out against Puneri Paltan on the mat. Patna Pirates had a disappointing Delhi leg of the competition after their streak of five wins came to an end with a draw against Tamil Thalaivas and the defeat against Gujarat Fortunegiants. Pardeep Narwal and co will hope to put this minor slump behind them and get back on the winning horse against Puneri Paltan to solidify their playoff chances. Currently, Patna Pirates are in the second position on the Zone B standings with 46 points from 16 matches. Puneri Paltan's form over the last few weeks has shown that the team has been severely affected by the absence of their star man Nitin Tomar. 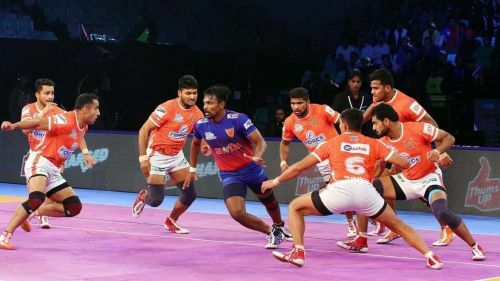 The raider has been injured for a major portion of the season and it has seen Pune's chances of making the playoffs plummet as the legs progress. They have picked up just two wins in their last eleven matches and have three games to play in the season. Dabang Delhi KC has leapfrogged them in the standings but Pune still has a chance if they win all their remaining matches. When and where to watch: 21:00 pm IST on the Star Sports network and on digital streaming platform Hotstar.